More you are creative; more chances you having to create epic and highly utilitarian pieces of furniture! Interior furnishings are always expensive and the dining tables after the bedroom just cost an arm and leg! Like always, DIY is still taking your basic furniture needs serious and providing awesome free solutions to approach a luxurious life even while short on money! 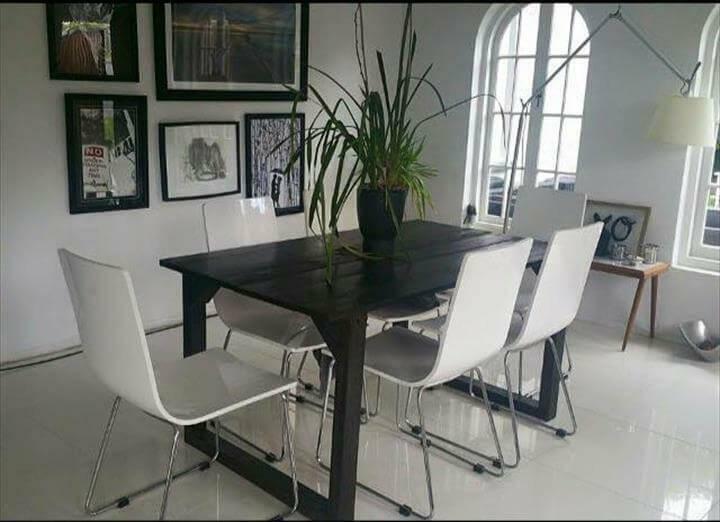 This DIY 6 person dining table is the type of dining table you can get free just by making a little effort! Pallet boards have been deconstructed to have a pile of pallet stringers and straight boards and then whole excellent construction of this dining table has been done with those removed pallet parts! Tabletop has been fabricated through easily flat alignments of pallet slats while thicker wooden lengths give sturdy legs to table to look young and beefy at same time! Top has been made a little edged just as per demand of an elegant modern dining table design has been finished with black shade of stain that empowers it with more strength, stability and weather protection and creates a dominant black look of it! 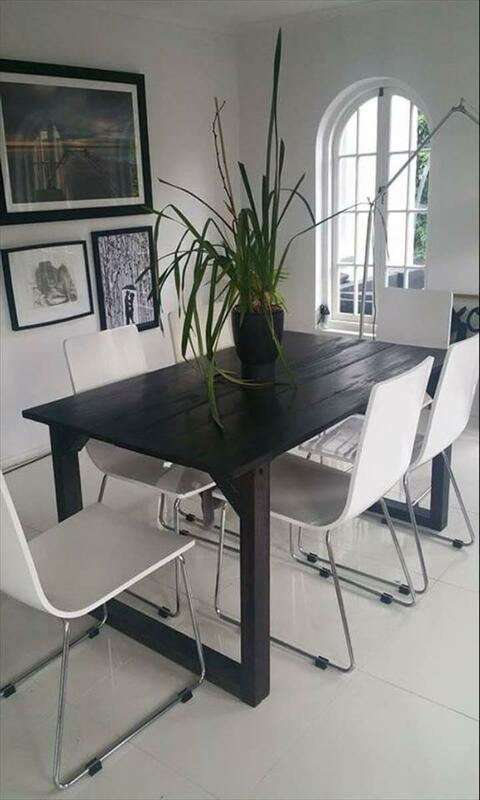 You can even recycle the pallets for furniture that can have a dominant existence in your highly modern interiors, this black wooden dining table is a brilliant example here! Table is having flat box like wooden legs which provide a balanced and more stable standing to table and are the feature from where the whole uniqueness of dining table come!